She was born 6 Sep 1786 in Edgecomb County NC and died 11 Apr 1813 in Davidson County TN at the age of 26. Jesse Wharton was born 29 July 1782 in Covesville, Albemarle Co. VA and died 22 July 1833 in Nashville, Davidson Co. TN with interment at Mt. Olivet Cemetery. WHARTON, Jesse, (grandfather of Wharton Jackson Green), a Representative and a Senator from Tennessee; born in Covesville, Albemarle County, Va., July 29, 1782; completed preparatory studies; studied law; admitted to the bar and commenced practice in Albemarle County; moved to Tennessee; elected as a Democratic Republican to the Tenth Congress (March 4, 1807-March 3, 1809); appointed to the United States Senate to fill the vacancy caused by the resignation of George W. Campbell and served from March 17, 1814, to October 10, 1815, when a successor was elected; resumed the practice of his profession; member of the board of visitors to the United States Military Academy, West Point, N.Y., in 1832; died in Nashville, Tenn., July 22, 1833; interment in Mount Olivet Cemetery. McKellar, Kenneth. “Jesse Wharton,” in Tennessee Senators as Seen by One of Their Successors. Kingsport, Tenn.: Southern Publishers, Inc., 1942, 135-140. Following are excerpts from this book relating to John Warton and his family. 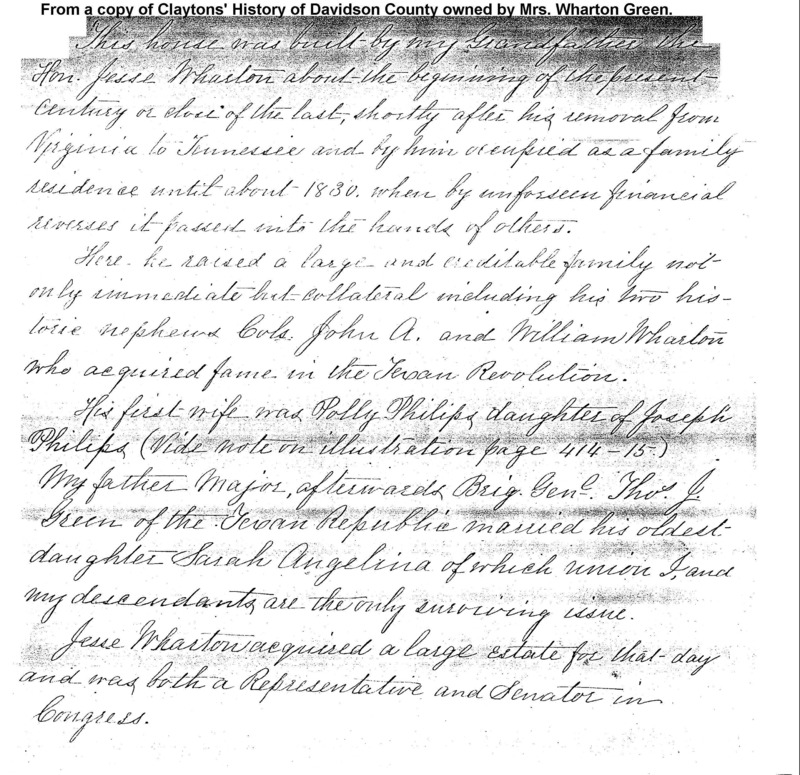 John Wharton, great-great-great-grandfather of Margaret Chambers-Bouton (Mrs. George Ralph Bouton), Lebanon, Wilson County, Tenn.
"The records of this office show that one John Wharton, Jr., served in the Revolutionary War as a private in Capt. Gustavus B. Wallace's Company, Third Virginia Regiment, commanded by Col. George Weeden. The date of enlistment is not shown. His name first appears on the company payroll covering this period from Oct 8 to Dec. 7, 1776, and is last borne on the company payroll covering the period from Jan. 1 to March 1, 1777. "The records also show that one John Wharton, Sr., served in that war in the same company and regiment. The date of enlistment is not shown. His name first appears on the company pay roll covering the period from Oct. 8 to Dec. 7, 1776, and last on pay roll from Jan. 1 to March 1, 1777. The records further show that one John Wharton served in said war as a soldier of Virginia Infantry, organization not further indicated. His name appears on a record under the following heading: 'A list of Virginia soldiers of the Virginia Line on Continental Establishment who have received certificates for the balance of their full pay agreeable to an Act of Assembly passed Nov.Session, 1781, which shows that on April 21, 1785, the sum of S. 13-D4 was received by one William Arnold? " John Wharton, born about 1746, married Rhoda Morris of Hanover County, Va.; settled in Albemarle County, near North Garden, Va., and reared his family of seven sons. Late in life he and his wife lived with his son, Jesse Wharton, at Nashville, Tenn., where he died March 3, 1816, of influenza. His wife died in 1827. They are both buried in Mt. Olivet Cemetery, Section 8, Lot 86. 1. George Wharton, born 1765, in Virginia; died Aug. 21, 1824, in Davidson County, Tenn.; married, first, Elizabeth Farrar; married,second, Elizabeth Harris. 2. William H. Wharton, born in Virginia; died in Nashville Feb. 3,1816; married Judith Harris, who died five days after her husband. 3. John Wharton, Jr., born in Virginia; died Feb. 7, 1845, in Bedford County, Va.; married Sally Lilbourn Logwood, daughter of Thomas Logwood. 4. Austin Wharton, M.D., born in Virginia; resided at Cartersville, Va., later Goochland County, Va.; died in Mississippi, 1835; married, first, Jane Logwood, of Powatan County, Va.; married, second, Lucy Goode; married, third, Mrs. Spears, nee Bates. 5. Jesse Wharton, born in Albemarle County, Va.; died in Nashville, Tenn., July 22, 1833; married, first, April 20, 1804, Mary "Polly" Philips, daughter of Joseph Philips and wife, Milbrey Horn, born in Edgecomb County, N. C., Sept 6, 1786; died in Davidson County, Tenn., April 11, 1813; children: John Overton, Joseph Philips, Rhoda Ann, Sarah Angelina, Mary Philips. Married, second, Elizabeth Auston Rice, of Virginia, cousin; children of second marriage: Thomas Jefferson, Jane, Ramsey, Fedelia and two others. 6. Samuel Leake Wharton, born in Virginia; died in Davidson County, Tenn.; married Lucinda Farrar. 7. Dabney Wharton, married Anna T. Swan. Son of Jesse Wharton and Mary “Polly” Philips and Great-grandfather of Margaret Chambers-Bouton (Mrs. George Ralph Bouton), Lebanon, Tenn.
Joseph Philips Wharton, son of Jesse Wharton and his first wife, Polly Philips, born in Davidson County, Tenn., Oct. 10, 1806; died in Wilson County, Tenn., Sept. 26, 1866; married Sept. 21, 1830, in Nashville, Tenn., by Rev. William Hume, to Caroline C. Hewitt, daughter of Robert Hewitt and Anna Shute, born Sept. 6, 1809; died Jan. 20, 1881. 1. Mary Ann Elizabeth Wharton, born Oct. 1, 1831; died 1924; mar­ried Frank Buchanan. 2. Robert Hewitt Wharton, born April 1, 1885; died Oct. 29, 1917; married Feb. 16, 1864, Margaret Taylor Davis; born Nov. 29, 1843; died Feb. 16, 1916. 3. Joseph Philips Wharton, Jr., born Aug. 23, 1837; died May 9, 1865; C. S. A. at Rock Island. 4. Jesse Wharton, born Aug. 19, 1839; killed in Battle of Murfrees­boro, Tenn.
5. Sarah Caroline Wharton, born Jan. 9, 1841; died Oct. 18, 1843. 6. Matilda Emma Wharton, born Feb. 22, 1833; married, first William W. Price; married, second, Ellis Harper. 7. Margaret Isabella Wharton, born Aug. 7, 1845; died March 24, 1901. Mary Caroline Wharton, born Feb. 17, 1848; died Jan. 20, 1900; mar­ried Jan. 20, 1870, Joseph Balie Peyton. Joseph Philips Wharton lived on his farm, three miles east of Leba­non, Tenn., where he built a water mill on Spring Creek. He and his wife are buried in private grave­yard on the place, which is now owned by his descendants. The following pages came from the book "Historical and Beautiful Country Homes in and Around Nashville, Tennessee" by May Winston Caldwell (published in 1911). Notice that Polly Philips' father, Joseph Philips, gave this home to Polly and Jesse Wharton when they wed. The name of the house is "Hill Crest". Jesse Wharton lived here until his death in 1833 and Samuel Watkins bought the house and 600 acres in 1844. Samuel Watkins never married. He owned the property until he died on 16 October 1880. Jesse Wharton's will appears below as filed in the Davidson County Court. 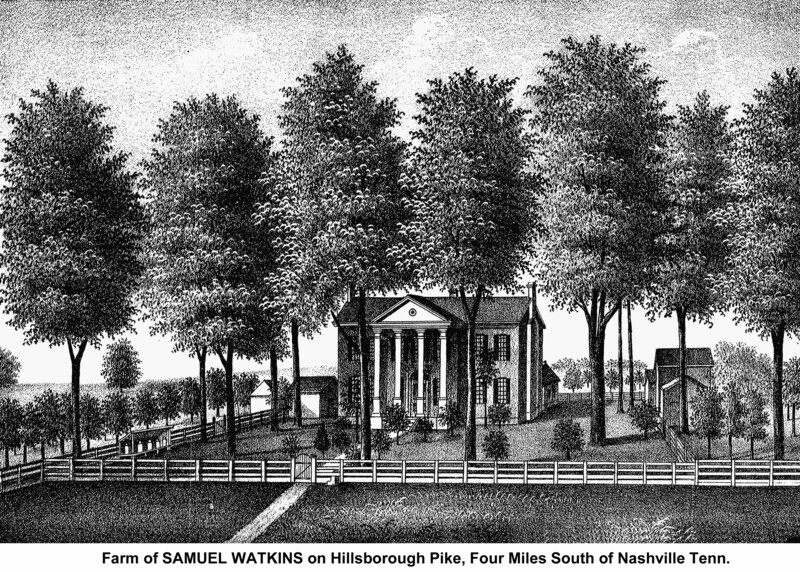 From 1827 to the opening of the late war, in 1861, Mr. Samuel Watkins was the most prominent builder and brick-maker in Nashville. In this business he was very successful. He early selected a farm for the home of his old age, first renting, and afterwards buying, the fine farm of nearly six hundred acres which he has since occupied, on the Hillsboro' pike ; this purchase he made in 1844. The war made sad havoc in his property; his city buildings were seized and occupied for war purposes for years, his fine park property demolished, his farm was the seat of battle, his mansion ransacked and robbed, fine shade-trees beyond price for their shade and beauty, fell before the axe of war, and a loss inflicted on a peaceful non-combatant of over three hundred thousand dollars, comprising property in negroes, buildings, cattle, and crops. 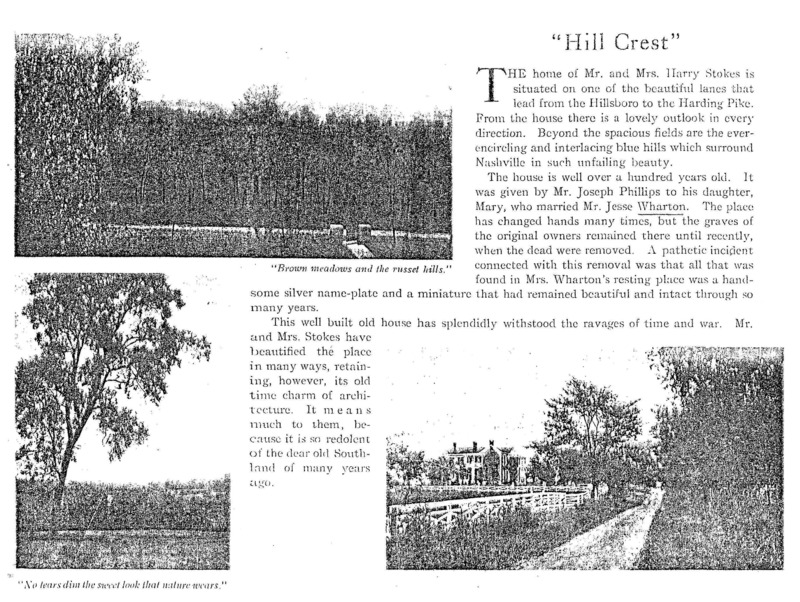 The below picture of Hill Crest appears in the book "A History of Davidson County" by Clayton on the page before the biography of Samuel Watkins. 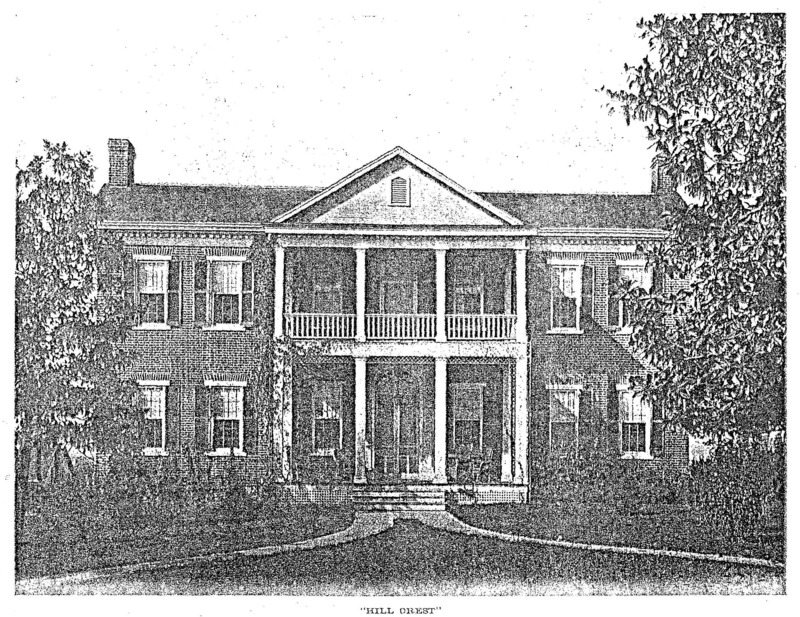 The below picture of Hill Crest is from the book "A Past Remembered: A Collection of Antebellum Houses in Davidson County TN" by Paul Clements and is the same house as the "Hill Crest" house above. According to Paul Clement, it is located on the north side of Golf Club Lane and is the second house to the west of the intersection of 23rd Avenue South and Golf Club Lane and the outbuilding in the photo above is still standing. The address is 2306 Golf Club Lane. The below satellite view shows the current house. 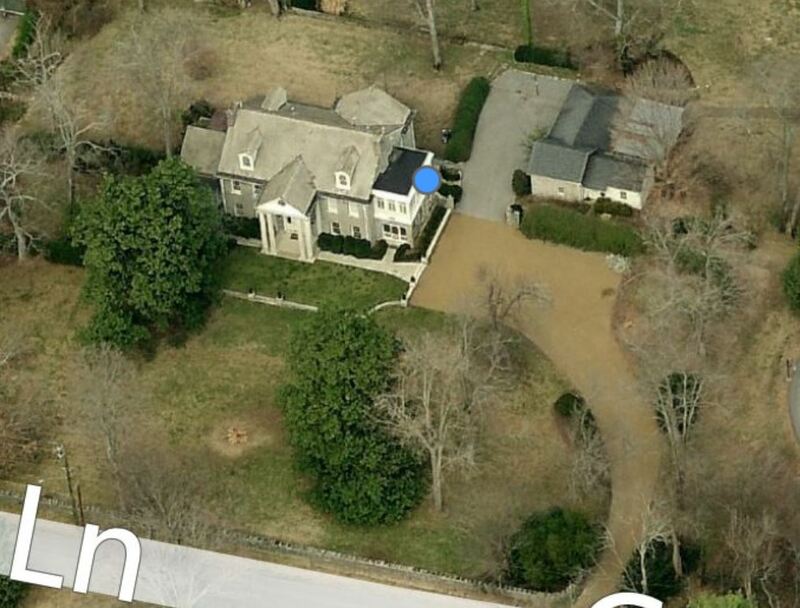 It appears to me from the above photos that the original lane leading to this house originated on Woodmont Blvd. just to the west of Hillsboro Pike about where 23rd Ave. S. intersects. The map below on the left is a U.S. Geological Survey map dated 11 Jan 1904 and shows the roads in existence at that time as well as showing the existing house locations. 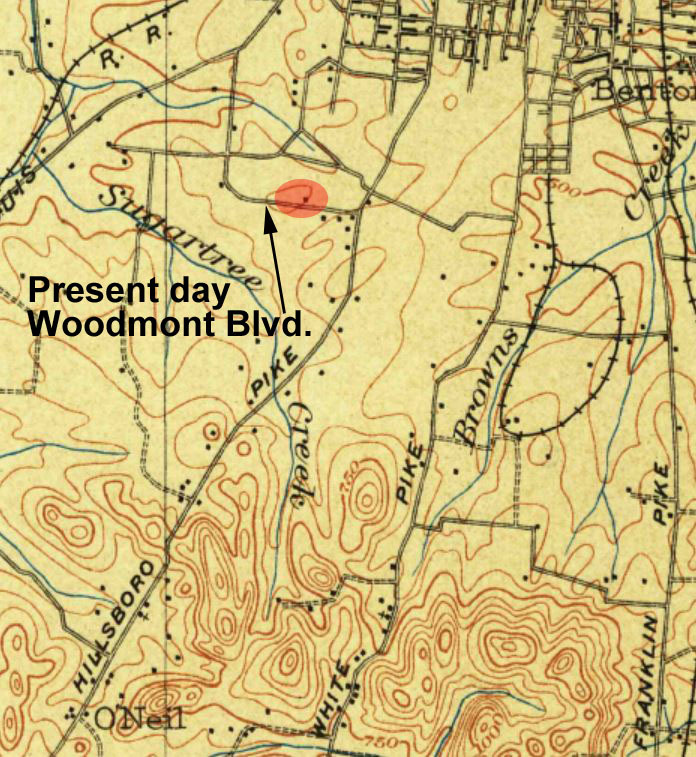 I have identified what I believe to be Hill Crest with an oval tinted red and identified what I believe is present day Woodmont Blvd. 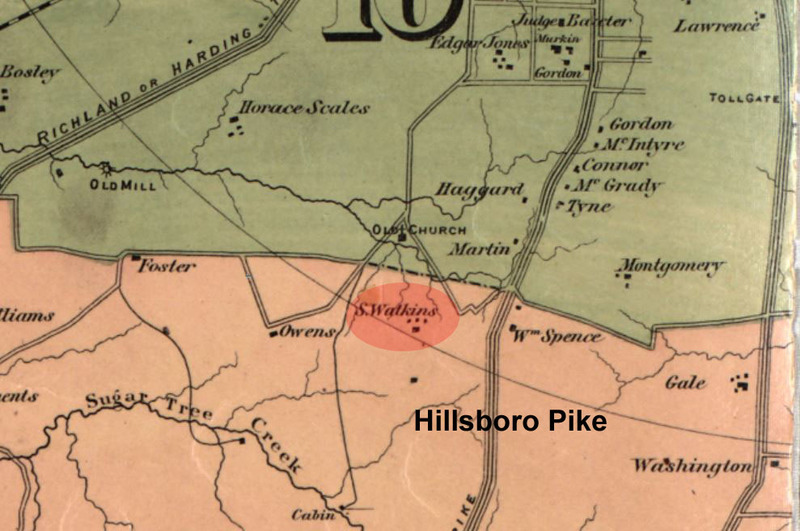 Also below on the right is a map of Davidson County made by Foster in 1871 showing the location of S. Watson's house which I have identified with an oval tinted red. My father, Thomas J. 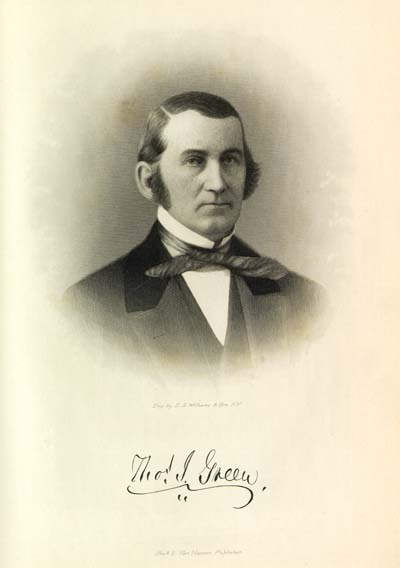 Green, afterwards General Green of Texan Revolutionary fame, married my mother, Sarah A. Wharton, of Nashville, Tennessee, on January 8, 1830. She was the daughter of Honorable Jesse Wharton, at one time United States Senator in Congress. They moved to his plantation, near St. Mark's, Florida, where I was born on February 28, 1831. By death I sustained the irretrievable loss of this last dear parent on March 11, 1835, being thus deprived of her ministering care at the early age of four years. She had met with the same great affliction when barely one year old. She was only twenty-three, and her mother twenty-six, at the time of death. The thought that oft recurred - would I not have been a better man had her life been spared a few years longer? Not that I have any right or cause to complain of the dear hands that received me. On the contrary, never did motherless waif pass into gentler and more considerate keeping. A few lines descriptive of this peculiarly interesting couple (my uncle, Joe Wharton, and his wife, Caroline) will not be out of place. They had married about the time that my parents did, and had the incipiency of a young family, which later on increased to large proportions. Two of their sons, and a son-in-law, died fighting for liberty, and the regret of both was that they could not duplicate their tender to the Cause. They took me into their house as if I had been one of their little fold, and for the nine or ten years succeeding accorded precisely the same. May their souls rest in peace, and their reward be commensurate to their unpretentious good works. Fortunately, they were well to do. A thousand broad acres of as inviting land as Middle Tennessee contains was their abiding-place, with forty or fifty sleek, overfed, contented negroes to cultivate them. The recollection of that home and the blessed spirit pervading it is a veritable dream of Arcadia. Everything used on the place was raised or made on the place, except sugar, coffee, powder and lead, and a few woman's fixings. The men-folk dressed in homespun, and were well content to get it. With no attempt at ostentation or display, they were nevertheless the most bountiful livers for their means, and in their simple way, that I have ever known. Hospitality was a synonym for home, the latchstring being ever on the outside of the door. In those blessed days, there were but few things to cause pain or occasion trouble. 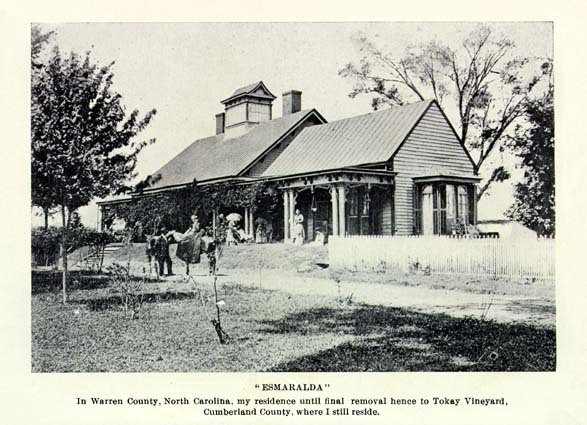 In his declining years my father, General Green, returned to his native county (Warren NC) and settled on a plantation on Shocco Creek, known as "Esmeralda," and passed his remaining days in the cultivation of corn and tobacco, old friendships and old-fashioned hospitality. He died 12 Dec 1863. 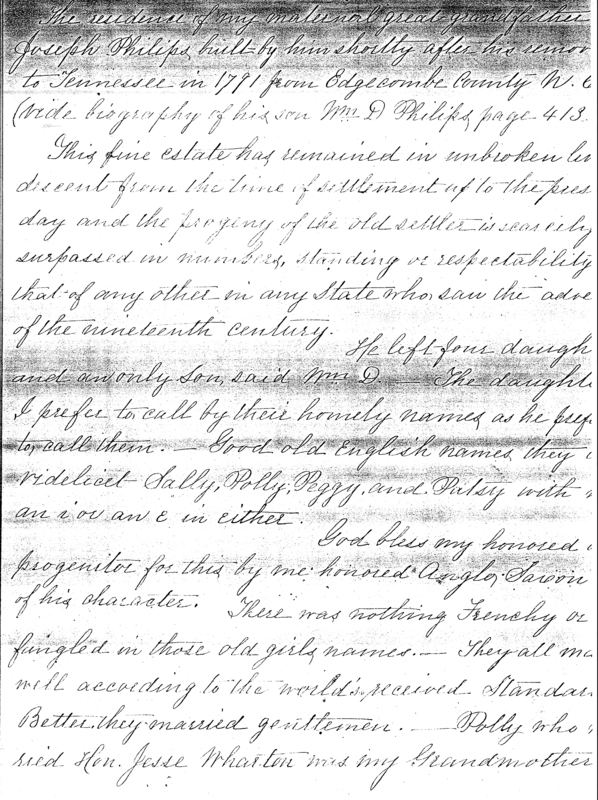 Col. Jack Green, in the book excerpt above, was married to the daughter of Jesse Wharton, Sarah Angelina Wharton. George Blow Elliott, whose sketch appears below, married Mabel E. Green, the daughter of Col. Wharton J. Green. GEORGE BLOW ELLIOTT, President of the Atlantic Coast Line Railroad Company, was born at Norfolk, Va., March 22, 1873, but he has lived in Wilmington since early manhood, when his father, the late Warren G. Elliott, came here as President of the Wilmington & Weldon Railroad. 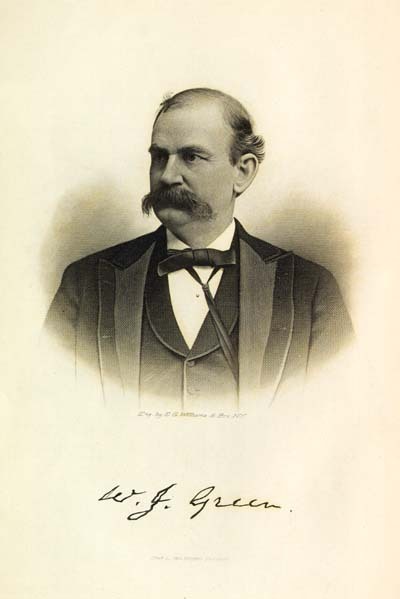 Industrially, he easily is one of the leading citizens of the community and the state and is among the principal railroad chieftains of America. Mr. Elliott's early education was acquired in private schools at Norfolk. He later attended the Norfolk Academy and graduated from the Virginia Military Institute. Class of ’92, with the degree of Civil Engineer. In 1896, he graduated from the Law School of Harvard University with the degree of Bachelor of Laws. It was in this latter year, also, that he actually began a railroad career that has carried him from special attorney of the great Coast Line System to its Presidency, together with the Presidencies of three other affiliated railways; the general counselship, advisory counselship, the chairmanship of boards or the directorship of still approximately a dozen others—the list of which will appear later in this sketch. The name of Elliott has been prominent in American railroad organizations for the last half century, including such men as Warren G. Elliott, father of George B. Elliott and first president of the consolidated Atlantic Coast Line System; John M. Elliott, general counsel of the big Santa Fe, Rock Island and other large railroads, principally in the trans-Mississippi region; and Howard Elliott, chairman of the board of the Northern Pacific, but whose fame rests chiefly upon his accomplishments in helping to build the Burlington Route, now a part of the Hill group, into its present importance. Elliott, George B., President, Atlantic Coast Line Railroad Company, Office, Wilmington, North Carolina. President Atlantic Land & Improvement Company, Wilmington Railway Bridge Company, the Belt Line Railway Company, Montgomery, Ala., and the South Carolina Pacific Railway Company. Vice-President, Northwestern Railroad Company of South Carolina, Winston-Salem Southbound Company, Charleston & Western Carolina Railway Company and the North Charleston Terminal Company. Chairman, The Executive Committee of the Charleston & Western Carolina and of the Board and of the Executive Committee of the Columbia, Newberry & Laurens Railroad Company. General Counsel: The Atlantic Coast Line Company. Advisory Counsel: Winston-Salem Southbound Railway Company and the Atlanta Birmingham & Coast Railroad Company. Director of: Each of the above companies and the Louisville & Nashville Railroad Company, the Washington & Vandemere Railway Company and the Charleston Union Station Company. That list is worth pondering. Especially so, since we, here in Wilmington, are accustomed to see Mr. Elliott sitting in the back rows at local Democratic political meetings; appearing, with other citizens, before the city and county commissioners to discuss hospital appropriations; working with committees on Red Cross donations; taking an active, but in nowise, noticeably leading part in St. James Episcopal, or other, church movements; and, with equally fine and most appealing modesty, performing such other duties as might be expected of a leading citizen in a comparatively small town—seeing him in these varied and pretty much commonplace roles one is liable to forget (and that is exactly what he would wish) the remarkably important niche he occupies in the industrial life of the greatest industrial nation in all the history of the world. The Atlantic Coast Line, when Mr. Elliott entered its service, in 1896, as special attorney, was a good railroad, then as now, “The Standard Railroad of the South,” but it tapped only a small area, lying along the main line through North Carolina and parts of Virginia and South Carolina, or between Richmond and Charleston. At this date, the Atlantic Coast Line System, proper, serves six Southern states, with trackage accumulating the total of 5,158 miles and, with its affiliated companies, the L. & N. and other lines, this total is increased to the aggregate of 14,477. Viewed from another angle: The Coast Line, with general offices in Wilmington and employing nearly 2,000 local people, owns and operates more than 1,000 locomotives; more than 34,000 freight cars; more than 800 passenger cars; plus a miscellaneous rolling stock of closs to 2,000 cars. With the L. & N. and other affiliated roads, these totals may be tripled and the approximate figures of the whole obtained. The Santa Fe, running from Chicago into the Greater Southwest and thence to the Pacific Coast, has a mileage of only 8,966, and the Rock Island System but slightly more. The Coast Line and its associate companies employ around 150,000 men and women, certain classes of whom are the most skilled and highest paid of any wage earning group in the United States. The Pennsylvania and New York Central lines, serving the most densely populated sections on the continent, each employs about 220,000. These figures are included merely to suggest the importance of the Coast Line and to show that it is one of the four or five largest railroad systems in the country, and to emphasize the fact that the President of the system is a resident of Wilmington. And, as a resident, he shoulders all the responsibilities of that residence, in civic, religious, educational and other matters. Just as Theodore Roosevelt was the most democratic of our Presidents, Mr. Elliott is one of the most democratic and unassuming of this nation's most important captains of industry, and, correspondingly, his personal friendship list is more numerous and genuine. As a member of the governing board of the James Walker Memorial Hospital, member of the Men's Club of St. James, of the Cape Fear and the Cape Fear Country Clubs and other organizations with which he is identified, he does his full share of the routine duties required to make these, or any organizations successful institutions. Mr. Elliott is of English descent. The first of his American ancestors was Peter Elliott, who came here from England, in 1730, three years before Wilmington was founded, and settled in Albemarle County, Va. He later removed to Norfolk, and later to Camden County, in the Albemarle section of North Carolina. He married Tamer Burgess, daughter of Dempsey Burgess. Wheeler's History of Carolina records that Dempsey Burgess was a delegate to the Halifax Convention, or Provincial Congress, in April, 1776, serving with Cornelius Harnett and William Hooper from the Lower Cape Fear. He also was lieutenant-colonel of field officers during that historic period and later served several terms as congressman from North Carolina. Wheeler's History also states that Charles Elliott, who probably was a relative of Peter Elliott, was one of the judges during the regime of the Colonial Governor, Arthur Dobbs, appointed by George II, of England, and whose administration, chiefly was distinguished for the frequent rows between him and the Legislature. Gilbert Elliott, grandfather of George B. Elliott, was born in Camden County, formed in 1777, from a part of Pasquotank, served as clerk of the superior court, practiced law and otherwise was prominent in that section. His son was Warren G. Elliott, late resident of Wilmington, second president of the Wilmington & Weldon Railroad, having been preceded by Col. R. R. Bridgers of Wilmington. As president of the Wilmington & Weldon, Warren G. Elliott became first president of consolidated roads which merged to compose the Atlantic Coast Line. A more detailed review of the Atlantic Coast Line appears in the Industrial Section in the back of this volume, and covers the period when he was president of the system. The mother of George B. Elliott was Margaret (Blow) Elliott, daughter of George Blow, for whom he was named. The Blows were early settlers in America, emigrating here in the early 1600's. George Blow was a native of Norfolk, but spent his young manhood in Texas where he assisted Gen. Sam Houston in the war for Texas Independence, 1836-37. He later returned to Virginia and became a circuit (superior) court judge. Two children, both daughters, born of the marriage of Mr. and Mrs. Elliott, are living. They are Margaret, now Mrs. John A. Hambleton, residing in New York City, and Esther E., at home.